It’s finally here! 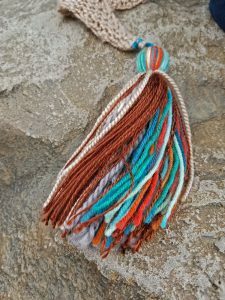 Tassels and stripes and unique shaping with colors and textures! This is an idea that I have been playing with in the back corner of my mind for quite a few years. I worked it up as a shawlette using novelty yarns and ribbons about 15 years ago, but it wasn’t really perfect, so I never published it. Recently, it crept into my thoughts again and I decided to give it another go. 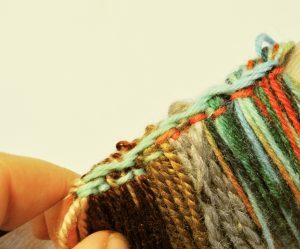 This time, it’s a hodgepodge of textures and colors, but without the eyelash novelty yarn that no one wants to work with, anyway. It’s really better this way. This is one of the outtakes from our photoshoot. Captain, our Border Collie just really wanted to be in the picture. 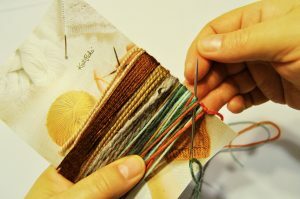 So, In honor of my Sedimentary Shawl pattern release, I thought I’d share a tiny part of the pattern with you. 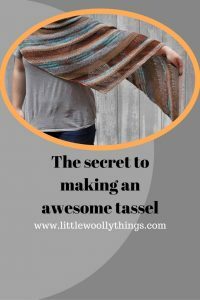 This tassel tutorial comes straight out of the pattern, which you can purchase from Knit Picks right here. 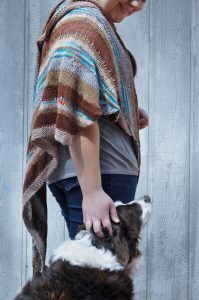 The pattern and tassels both require a wide variety of yarns, from Aran weight to lace weight. There have been skeptics who said that it couldn’t be done, but with a lot of trial on my part (so you don’t have to) with different needle sizes and stitch counts, I have hit upon the magic combination that allows these different weights to drape and flutter nicely in the breeze. They really do play together very well, if you know how to handle them. So, without any further ado, here is the tutorial. Cut a piece of Stroll Koi Pond yarn about 3 feet (1 meter) long. Thread onto yarn needle so that yarn is doubled. 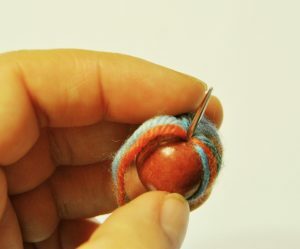 Bring yarn up through the hole in one bead, holding onto the yarn tails underneath. 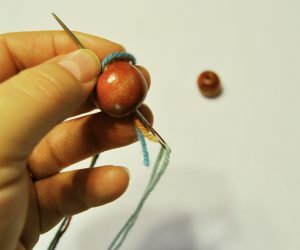 Wrap yarn around the bead and through the hole until you have used up all the yarn on the needle. 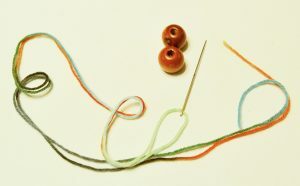 Cut another piece of yarn and continue in the same manner until the entire bead is covered. Cut the yarn, leaving a tail for sewing to the shawl. 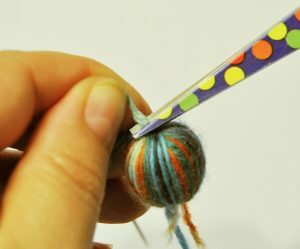 Next, using one yarn at a time, wrap yarn around your cardstock to create a 4-inch (10cm) long tassel. 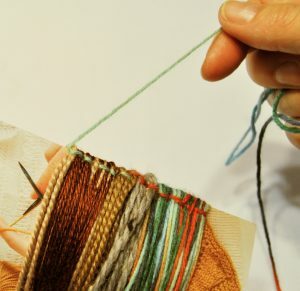 Cut each yarn at the bottom of the card and begin the next color at the bottom, where you left off. You can use as many wraps as you like. 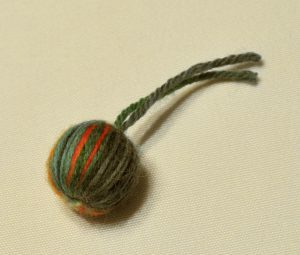 I used about 15 wraps of the Paragon yarns, 12 wraps of the City Tweed, about 40 wraps of Luminance and 20 wraps of Stroll. When you have finished your last wrap (I used Stroll last), cut your yarn leaving about a 2-foot (60 cm) long tail. 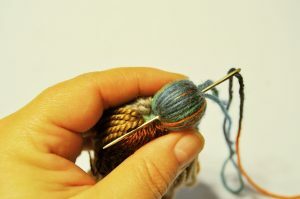 Thread yarn end onto yarn needle. 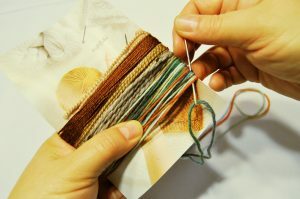 Stitch through the top of the yarn wraps using a backstitch all the way across the top of the yarn wraps. 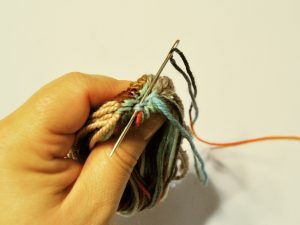 Then, after you’ve stitched all the way across, do it again backwards across the yarn wraps, making your stitches offset from the first row of stitches. These don’t have to be pretty (thank goodness) because no one will see them. 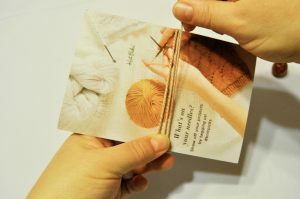 Then, slide the card out from the center of the yarn wraps. 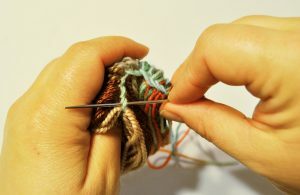 Fold the stitched edge together and stitch through the backstitches to hold the tassel together. 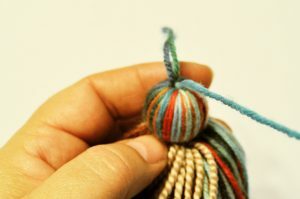 Now, take the yarn with the needle up through the yarn-wrapped bead (this will be very tight) and then back down through the bead again. 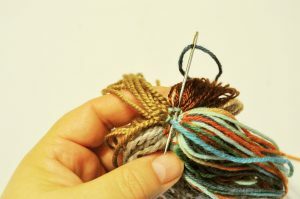 Flip the tassel upside down so that you can see the stitches in the center of the tassel and stitch securely to create a knot. Cut your yarn. 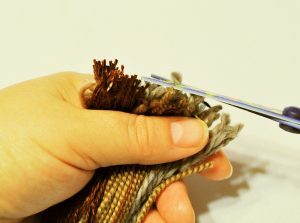 And then, use your scissors to cut through the yarn loops and trim the bottom edge evenly. 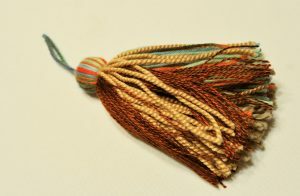 And this completes your tassel. 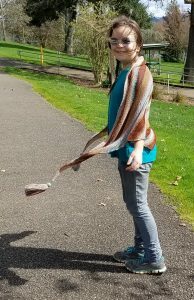 If you are making them for my Sedimentary Shawl pattern, you will need to make one more, then sew them securely to the long points at either end of the shawl. Thanks, KJ! I’m working on posting more tutorials here, and I’m so glad you found my blog. Support through ko-fi.com helps me to pay for podcast giveaway prizes and the cost of shipping out those prizes to YOU!